I have an Army of unfortunate Scottish 'Lasses in Waiting' for a photograph of their grave. We would be most grateful if anybody can assist. Will PM email add if required. Do you have any more detail regarding her? Will try and get you the Blair Atholl & Pitlochry ladies when back at work. Intend to do cemeteries in the fullness of time but mostly war memorials first. I'll have a rake for Annie Campbell, the Tollcross lady, but I think she was amongst those I was never able to find. Just checked my PMs and nothing there from you; Looks like the Gremlins have been at work. Will have a check and come back to you. I can help with the Ayr graves. I live but 2 miles away. Is it photographs you need? Yes please- grave photos. shall I pm my email add? The two East Kilbride Lassies are listed under East Kilbride, Lanarkshire. I have a picture of the stone of Agnes Wilson in Kilwinning cemetary, would you like a copy? I'm not sure how to post? This has also been posted in the Ayrshire section, Irvine Old Parish Church. 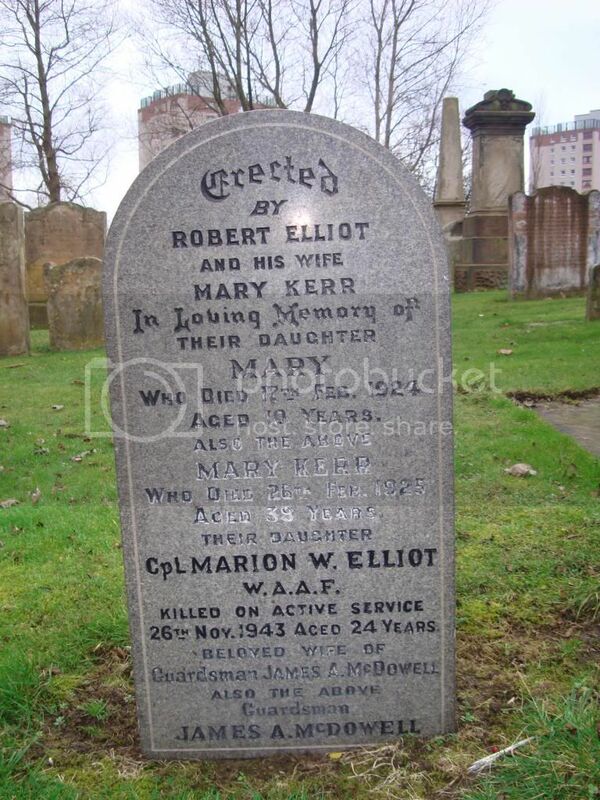 Daughter of Mr. and Mrs. Robert Elliot, of Irvine. Wife of Gdsmn. James Alexander McDowell, Scots Guards, killed in action in Italy, 6th July, 1944.